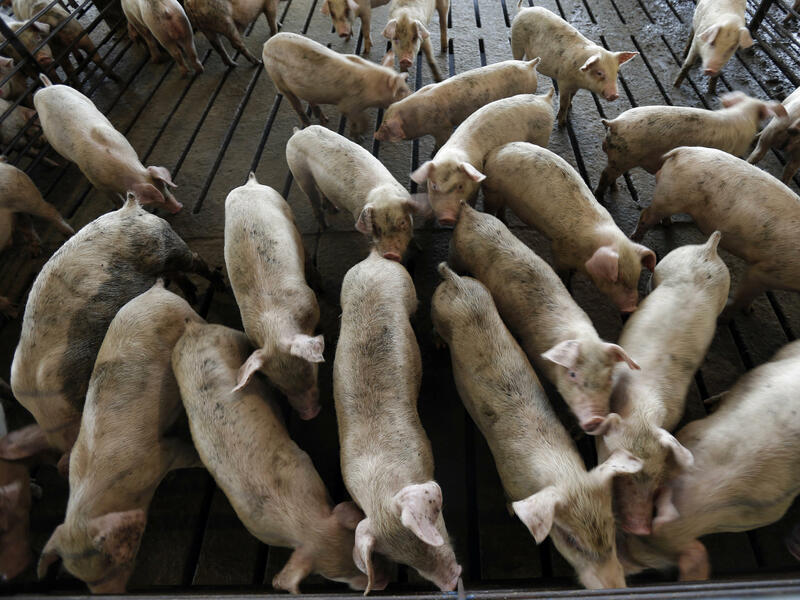 Young hogs are seen at a farm in Farmville, N.C. From farmers to meat-storage facilities, to auto parts manufacturers, the impact of tariffs is spreading. In response, on Tuesday, the Trump administration announced an estimated $12 billion in aid to farmers affected by the tariff wars. But the tariffs aren't just affecting farmers. Chuck McCarthy runs a cold storage meat warehousing business in the port of Wilmington, N.C.
"Well I'll tell you, we're a relatively new company," he says. "We've been very busy the first year and a half but have noticed a change since the tariffs with China and all have started." McCarthy says his biggest customer was sending him sizable loads of pork products every day to ship to China. It was a lot a work — more than $100,000 a month. "We're blast freezing that product for them, we're storing it for 'em, we're preparing it for export, we're loading the containers out," McCarthy says. But he says that about four weeks ago, "it just stopped." McCarthy called to find out why. "They said their company was not packing anything for China as a result of the political situations that were going on." So the trade fight between the Trump administration and China means a big hit for McCarthy's business. But the U.S. economy overall is strong and so far the tariffs are affecting a very small fraction of it. And that's even true for the refrigerated warehouse and shipping industry that McCarthy's a part of. "Our members are not reporting any impact from the tariffs at this point," says Corey Rosenbusch, president of the Global Cold Chain Alliance, an industry group. He says some members like McCarthy might be getting hurt — but the problems so far don't seem to be widespread. Rosenbusch says most refrigerated warehouses are packed to the rafters with all kinds of products that are not for export or affected by tariffs, including frozen pizzas and chicken for local stores. "I was at a facility the other day that stores coffee creamer and they had 75 different kinds of coffee creamer they were storing," he says. Demand for storage overall has been rising despite the tariffs, he says. But while the trade fight isn't affecting most of the economy yet in a big way, many industries are worried that the damage could quickly get a lot worse — especially if President Trump follows through with more tariffs he's considering, for example, on cars and auto parts. The auto and parts supplier industries are opposed to the tariffs. "We have 870,000 Americans who are employed by our industry," says Ann Wilson with the Motor and Equipment Manufacturers Association, which represents the parts makers. She says her members have already been hit by steel and aluminum tariffs and retaliatory tariffs from China. "What I'm hearing from members now is they are not filling jobs that they have available because they're not sure that they're going to have the work for them in the future," Wilson says. She is worried an ongoing tariff fight will mean a slowdown and job cuts in her industry. For his part, McCarthy, the North Carolina refrigerated warehouse operator, says he supports the president trying to get better trade deals. But McCarthy doesn't want all this to drag on for much longer either. "If you start having problems with tariffs and people not wanting to buy our products and we not buying theirs," McCarthy says, "after a little while you gotta pull it back in a little bit and say, 'Well, let's negotiate on that a little more.' You can't just have a hard line all the time." That's exactly the kind of conversation European Commission President Jean-Claude Juncker will be likely trying to have with Trump at the White House on Wednesday. We're going to get another view of how the growing trade fight is affecting American businesses by learning about what's happening inside U.S. meat lockers. Here's NPR's Chris Arnold. CHRIS ARNOLD, BYLINE: If you want to see what a trade fight can do to exports, what's happening with pork is pretty dramatic. Mary Lovely is an economist at Syracuse University, and she says after two rounds of retaliatory tariffs by China, ham and various other pork products now face massive tariffs between 62 and 70 percent. MARY LOVELY: In recent weeks, the U.S. Department of Agriculture has reported zero weekly export sales of pork to China. So our exports to the country have pretty much collapsed. ARNOLD: That doesn't just affect hog farmers. Chuck McCarthy runs a cold storage meat warehousing business in the Port of Wilmington at North Carolina. CHUCK MCCARTHY: Well, I tell you. We're a relatively new company. We've been very busy in the first year, year and a half and - but have noticed a change since the tariffs with China and all that started. ARNOLD: McCarthy says his biggest customer was sending him sizable loads of pork products every day to ship to China. It was a lot of work, more than a hundred thousand dollars a month. MCCARTHY: We're blast-freezing that product for them. We're storing it for them. We're preparing it for export. We're loading the containers out. MCCARTHY: About four weeks ago, it just stopped. And I called to inquire about why it had stopped, and they said that their company was not packing anything for China as a result of the political situations that were going on. ARNOLD: So the trade fight between the Trump administration and China means a big hit for McCarthy's business. But the overall U.S. economy is strong. And so far, the tariffs are affecting a very small fraction of it. And that's even true for the refrigerated warehouse and shipping industry that McCarthy's a part of. Corey Rosenbusch is the president of the industry group the Global Cold Chain Alliance. COREY ROSENBUSCH: Our members are not reporting any impact from the tariffs at this point. ARNOLD: Rosenbusch says some members like McCarthy might be getting hurt but not enough to get on his radar. He says most refrigerated warehouses are packed to the rafters with all kinds of products that are not for export or affected by tariffs - frozen pizzas, chicken for local stores. ROSENBUSCH: I was at a facility the other day, for example, that stores coffee creamer. And they had 75 different types of coffee creamer they were storing. ARNOLD: But while the tariffs aren't affecting most of the economy yet, many industries are worried that the damage could quickly get a lot worse, especially if President Trump follows through with more tariffs that he's considering, for example, on cars and auto parts. That industry is opposed to the tariffs, and some companies say they're already holding off on hiring and are nervous about the impact on jobs going forward. For his part, the warehouse operator Chuck McCarthy says he supports the president trying to get better trade deals, but he doesn't want all this to drag on for much longer either. MCCARTHY: If you start having problems with tariffs and people not wanting to buy our products and we not buying theirs, you know, after a little while, you've got to pull it back in a little bit and say, well, let's negotiate on that a little more, you know (laughter)? ARNOLD: That's exactly the kind of conversation the president of the European Commission, Jean-Claude Juncker, will be likely trying to have with President Trump at the White House tomorrow.  Chris Arnold, NPR News. Transcript provided by NPR, Copyright NPR.